If you want a high-quality home security camera system but you can’t be bothered to run wires or recharge batteries every few months, we’ve got just the thing you’ve been looking for. 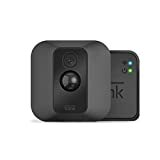 The Blink XT Home Security Camera System includes all the features you would expect from any good camera system, plus so much more. These cameras are cord-free so you don’t have to worry about Ethernet cables or chargers, but they run for an incredible 2 years before the two AA batteries need to be changed. They’re also weatherproof so you can set them up inside or outdoors. Amazon sells 1-camera systems, 2-camera systems, 3-camera systems, and 5-camera systems that each come with a hub, and then additional cameras can be bought individually so you can expand whenever you want to.